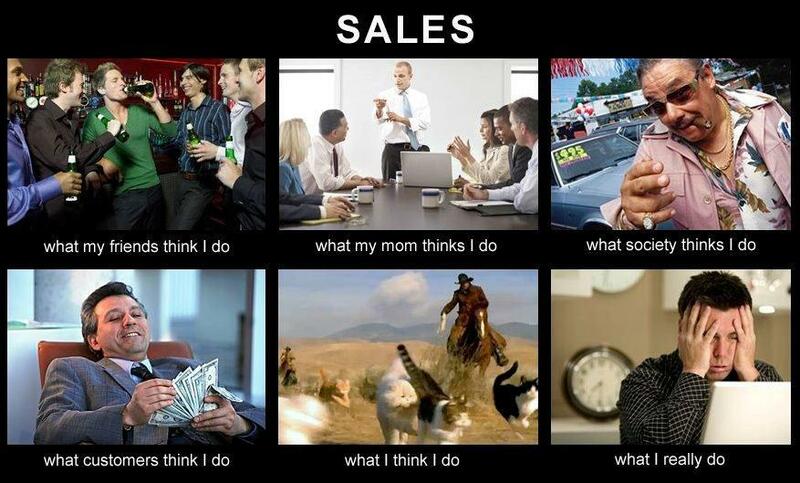 Have A Laugh Fridays – Different Perceptions of Sales Reps (Most Popular Yet) | Sell, Lead, Succeed! This has been my most popular Have A Laugh Fridays Edition since I posted it in early March. It is a fantastic overview of the different perceptions of sales reps. Enjoy this quick one, have a great weekend. Back to new “HALF’s” next week. Posted on July 27, 2012, in Have A Laugh Fridays and tagged Funny, Humor, Laughter, Leadership, Management, Perception, Reality, Sales, Selling, Success. Bookmark the permalink. 21 Comments. Thanks for the like on Time For Some Humor…appears you may enjoy the occasional chuckle yourself. Thanks for your comment. This is a great site! Appreciate the Friday laugh! You are welcome Ginny! Thanks for stopping by. We should be laughing every day, but I am making a point of it for everyone on Fridays! Have a great weekend.. Thanks for liking strategy execution. Yours is a forward looking blog..you got a follower!! You are welcome! And thanks for the compliments. Have a great weekend.. I love this picture. Is it for sale as a poster? Have you seen the one for A.D.D.? Since most sales people have A.D.D., they really appreciate it. Hey Kitty! Thanks for the comment. I really don’t know if it is available as a poster. A friend of mine just forwarded it to me in an email. I would love if you sent me the link to the A.D.D one. I am sure it is funny. Thanks again..
Nice blog you got going here Tim. Thank you very much for taking the time to comment, and the kind words. I am enjoyed your blog as well, and just followed! Have a great weekend.. Loved the post, made me laugh. Not enough laughter in the world. Thanks for the like. You are welcome! Glad you enjoyed it. And, you are welcome for the like! Take care..
….the pictures say it all!!!! This is too funny, I had seen it on facebook and was trying to show a client on Thursday but couldn’t locate it. Bam, there it is on Friday on your blog, thanks, I have forwarded it to my client so you never know, you may get another follower.